A Sussex Police spokesman said Rudi Gomes, 29, was pulled over on the A27 at Tangmere on September 11, at about 11pm, after being spotted driving without any lights on. Gomes, a building labourer from Neville Duke Way in Tangmere, was required to undergo a roadside DrugWipe, said police, due to his demeanour and a strong smell coming from his vehicle. He tested positive for cannabis, police added. The police spokesman said Gomes was arrested and asked to provide a blood sample, but refused and claimed he did not feel impaired. He later told police he did not like needles. A small amount of cannabis was found in his underwear, said police. Gomes was charged with failing to provide a specimen of blood for analysis when suspected to have driven while over the limit for drugs, said police, and for possession of cannabis. He was also charged with failing to surrender to custody, having been released on bail. 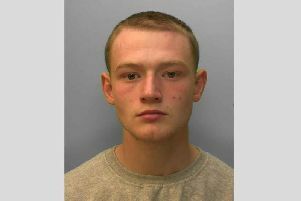 He was convicted following a trial at Worthing Magistrates' Court on January 4, and the case was adjourned for sentencing on February 27, said police. Police said Gomes was sentenced to a 12-month community order, requiring him to carry out 60 hours of unpaid work, and disqualified from driving for 36 months. He was also ordered to pay £775 costs and an £85 victim surcharge. PC Tom Van Der Wee, of the Arundel Roads Policing Unit, said: “Gomes showed a blatant disregard for the law, and for the safety of himself and other roads users by driving while over the limit for drugs. “He then failed to provide a specimen of blood in custody, which is a legal requirement, despite being given numerous opportunities to do so. He claimed he had a phobia of needles, despite having a number of tattoos on both arms.